CALIFORNIA CITY, Calif. — K-9 officer Ty is said to have made a big impact for the small police department in California City. Hurtado said K-9 Ty often played a critical role at dangerous scenes and ultimately it was an injury on the job that cost him his life. “In August of 2016, he was called to a barricaded person in the community of Boron and there they deployed Ty. He had to engage the suspect,” said Hurtado. Ty hurt his back and succumbed to his injury on September 1, 2016. Thousands turned out as the community of California City and beyond honored K-9 Ty’s life and service. 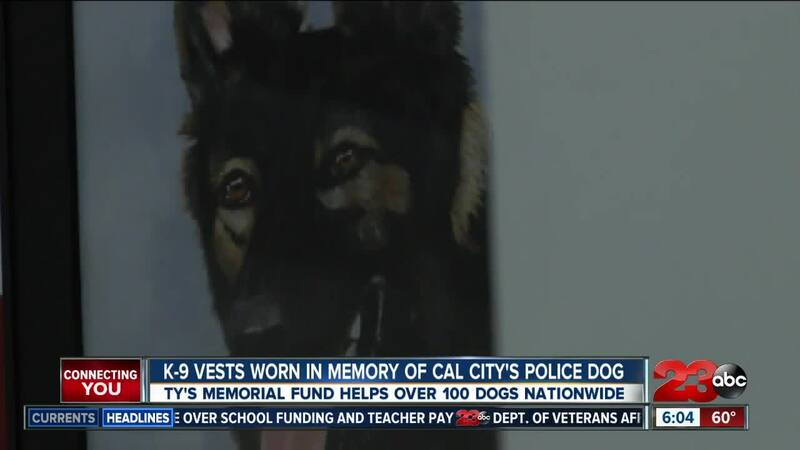 Chief Hurtado directed donations to Vested Interest, and organization that provides bullet and stab proof vests to law enforcement dogs around the country. The organization had previously donated a vest to K-9 Ty. Two year later, Vested Interest says over $90,000 have been donated in K-9 Ty’s name. The donations have provided over 100 K-9 vests bearing Ty’s name to departments across the country, including the Shelbina Police Department. SDP Officer Cole Hinshaw says he’s grateful for the protection for his partner K-9 Zuka. “It was a big relief. We have been responding to calls for about a year now without a vest. Some of these guys that we have been tracking have made threats against law enforcement so I know they wouldn’t have any problem taking the life of my K-9,” said Hinshaw. You can find more information on how to donate to Vested Interest on their website.